He's definitely out according to Auk-Eye. "Sorry officer, my glasses came off and I only got a quick glimpse of the person that attacked me"
"So.. let me get this right..We are looking for a dwarf in a tuxedo?.." Percy is just not interested in snorting white lines. He was hit by an arctic lorry. "What makes you think the killer is a seal, Inspector Penguin?" Ok sarge, I'II bring the suspect in. He'll soon be picked up in an identity parade.
" Don't give up now, you just need to flap a bit more.....and a taller tower." 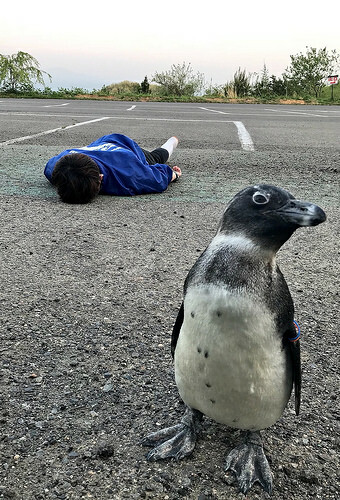 The case has been referred to the Ministry of Silly Auks. And I am Ms. P reporting live from the channel “birds eyeview“ from the notorious parking lot where this incident happened! You didn't see anything human. "Why are homicidal penguins always caught?" "I don't know: WHY ARE homicidal penguins always caught?" "...because, they can't 'take fight.' "
I did warn you not to try and cover it in chocolate! What do you sea lion there? Fillet a report, log the time and plaice. For violent content, 'Dances with Wolves' has been overtaken at the box office by 'Face-plant with Penguins'. This picture popped up out of the blue Guv. Right what we got? A sea bird and a football team that should be playing in a pub car park. Get your coat we're off to Chelsea. Should I call the police sturgeon? No. You can clearly see his number is up. "Well, he was blabbing on about killing two of us with one stone & I just wasn't having any of that." Looks like the cyclist's helmet came off. There's the Chinstrap. The new David Brent character will be lighter but will also have a dark side.